Ellipse Technologies, Inc. has received FDA approval for its new PRECICE Limb Lengthening device in the United States. Limb lengthening procedures are done to restore the length to limbs that are shortened by birth defects, major fractures, and other medical problems, including cancer surgery. The PRECICE Limb Lengthening System is an externally controlled internal limb lengthening device that consists of a telescopic titanium rod that is surgically placed into either the thigh bone or shin bone. Inside the rod, there is a miniature magnetic motor and gear box that creates the force needed to lengthen the rod (once it has been implanted in the bone). The internal motor is powered by a magnetic field generator, which is held on the skin, next to the leg, several times a day for a few minutes. Limb lengthening is used to fix upper and lower limb length deformities. New bone and soft tissues are gradually grown through a combination of surgery and either an internal or external fixator. This new growth is called tissue "regeneration." Bone and soft tissue regenerate when they are slowly pulled apart at a rate of approximately 1 mm per day. The PRECICE is the first FDA cleared implantable limb lengthening device that offers a prescribed rate of controlled limb lengthening and has the ability to reverse directions. Ellipse and its scientific advisors say the PRECICE devices will reduce the complications (infections) during the healing and recuperation period. 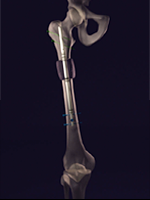 This device can be use to lengthen the Tibia (shin bone) or Femur (thigh bone). At the Limb Lengthening Institute of Los Angeles (LLILA) we recommend using this device only in the absence of deformity in the long bone. If there is any angular deformity we still recommend using external fixation devices such as Ilizarov fixator or Taylor Spatial Frame. We believe that cosmetic height lengthening can be best achieved with and internal lengthening device such as the Precise IM Rod. 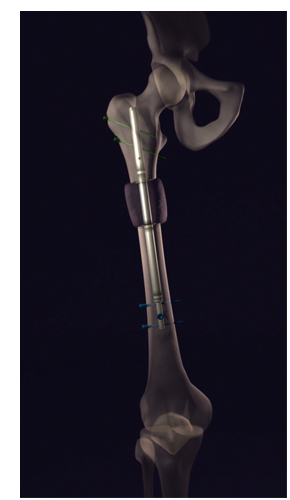 Since this device is all internal, there are less post operative challenges when compared to external fixation devices.